The Queensland Islands and the Great Barrier Reef region of Tropical North Queensland are the jewels in Australia's crown. Located on the far north coast, Queensland's Great Barrier Reef islands are ideal for a romantic getaway, your honeymoon, a family vacation, an adventure holiday or a relaxing break. In fact anyone looking for an idyllic, exotic, sun kissed and pristine holiday destination that is a unique escape from the everyday stresses of life will love the Queensland Islands. There is a huge with a choice of accommodation for all budgets ranging from secluded luxury lodges and elegantly sophisticated resorts, through to family oriented island getaways. For a romantic escape try Lizard Island, Hayman Island, Hamilton or Haggerstone Islands. For a holiday in absolute luxury try Hayman Island, Green Island and Lizard Island. For the perfect family holiday for some quality time together and fun in the sun, you'll love Hamilton Island, Hayman Island or Daydream Island for tropical family holidays. 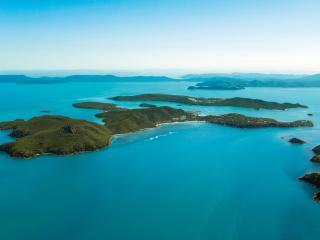 Hamilton Island is easily the most popular island out of all the islands off the Queensland Coast. Holiday goers have the choice of several resorts, hotels and varying costs. Daydream Island is well known for its family holiday accommodation and kids club but what some people don't realise is that Daydream is also a favourite for honeymooners. There is so much to see and do on the Queensland Islands, with activities as many and diverse as the islands themselves. If you enjoy diving or fishing then Heron, Wilson, Lizard or Lady Elliot are for you. If you're a nature lover then see it at its best on Lady Elliot Island with turtle hatching, bird rookeries and whale watching. Or why not cruise the reefs and islands with Coral Princess Cruises or Captain Cook Cruises? You'll also have the unique opportunity to hand feed a pod of dolphins in crystal waters of Moreton and Tangalooma Islands. And with the Great Barrier Reef at your doorstep, lose yourself in this unique World Heritage Listed natural wonder of the world. The tropical Queensland Islands offer fantastic holidays for couples, families and friends and provides a range of accommodation and sightseeing options to suit all budgets. One of the best ways to make the most of your money and your holiday is with island holiday packages that offer significant savings by combining all your travel needs into one discounted package. Take the stress out of planning your holiday and let us do the work for you. We'll find you the best deals on everything from flights and accommodation to transfers, tours, meals and more. You'll also enjoy access to an exclusive range of added bonuses including free nights, complimentary massages or tours and much more. Many of the Queensland Islands are accessible from the mainland with connecting launch transfers or flights from major cities. Australians drive on the left hand side of the road, with speed limits expressed in kilometres that vary from 50 km per hour in residential and heavy traffic areas to 110 km per hour on freeways. Roads are generally good and major routes well signposted. No service charge applies in Australia and tipping is not mandatory however a small tip in restaurants and hotel bars is normal for good service.